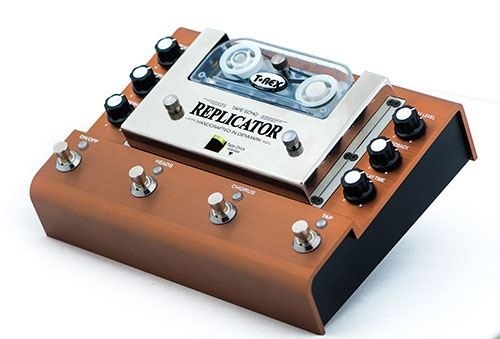 The Replicator is T-Rex Engineering´s take on the ultimate tape echo unit, complete with a motor, magnetic heads and a tape cartridge. The goal was to make a tape echo unit that could nail the sound quality of the old echo units, but surpass them in features. Size, ease of use and super-fast tape replacing were obvious areas of improvement, but we also put in tap tempo, two playback heads for three output modes and a chorus mode that modulates the pitch of the echos. The tape cartridge (available separately) can be replaced in seconds and the high headroom of the circuit will allow you to use this pedal for processing line signals as well (keyboards, P.A. aux sends, preamps, etc. ).